Billing is one of the prominent process involved in business, it might be either large scale or small scale business. Huge number of calculations needed to be done simultaneously along with business, billing machines serve the purpose to save enormous amount of time.Tracker Mini another product of VERTEX COMSYS also belongs to the category ofElectronic Billing Machine. Itis the modified replica of Tracker Pro, it is basically manufactured for slighter electronic billing purposes. The name itself is self-describing about the product. It serves to acquire quick billing mechanism in small scale level. Generally manufacturers concentrate much on requirement of outsized companies, we at VERTEX COMSYS consider upcoming smaller group of companies too. Tracker Mini is one such product that meets the needs of marginal companies. It is preferably manufactured for minor business like Fast food outlets, Small retail shops, Billing at Petrol pumps, ShiftAccounting, Day accounting, Stock Maintenance, Cash Maintenanceetc. TRACKERMINI incorporates distinct features like value based sale, mixed mode sale and various others in it.It is a easily operable tool which can store accounts of up to 500 customers .SMS module is an optional feature available for information transactions. Overall TRACKER MINI facilitates user to modify the product accordingly, the option to format the font with relevant size and colour is also possible. Prolonged battery backup is notable aspect in our product print. UNIVERSAL SERIAL BUS pen drive can be used to transfer data from billing machine to other devices. Our machines are not user specific , any candidate with general awareness can handle it smoothly. Designed for Restaurants and Retail outlets for billing, Shift Accounting, Day accounting, Stock Maintenance, Cash Maintenance and more. TRACKER PRO can operate in stand -alone mode or connected mode. Chain of outlets can be centrally administrated in the connected mode. Tracker Pro is easy to operator and generates a variety of reports like day report, stock report, item wise report which can be printer on the inbuilt printer, external printer, copied to a USB pen drive as an MS-Excel readable file. With the rapid transformations that happened in the arena of science and technology, the present era witnessed the emergence of a lot of devices that changed manual labour into computerized work. 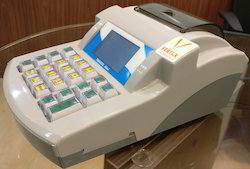 Electronic Billing Machine manufactured by Vertex is such a device which is created for making the billing process simple and easy at restaurants and retail outlets. It also helps in shift accounting, day accounting, stock maintenance and cash maintenance. 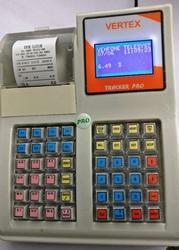 The Electronic Billing Machine introduced by Vertex is known as Tracker Pro. Tracker pro is greatly used for various businesses such as hotels, petrol pumps, groceries, bakeries and poultries. It aims at high performance and eases your work and helps in automating your business effectively and reliably. It has some attractive and user friendly features which makes it popular among customers. It has an inbuilt memory and it consists of 48 keys with 24 hot keys. Its speciality is that it has a large graphic display or TFT display and an in-built thermal printer which is upgradable into 3 inches. The in-built battery is durable up to 10 hours of working and up to 1000 bill printings. It can be used for 10 login users thereby increasing usability. When you use this Portable Billing Machine the item names and rates can be loaded through a USB pen drive. The items can be selected through code or they can be searched by names. What adds to the universality and versatility of this product is that you can have the item names and the print out in the language you prefer. It comes with 100 tables with 50 unbilled items in each table and it has the provision to tag waiter name to the bill which is very helpful for the hotel/restaurant industry and it enhances the transparency of the cash dealings between the customer and the entrepreneur. In connected mode Sale, Purchase and Cash transactions are automatically transferred to a central Computer through GPRS. The transfer happens in the background without affecting user operations. In case of loss of connectivity data is queued up and pushed to the server when connectivity is restored. PLU management including rate changes can be done from the Server. A FREE WINDOWS APPLICATION (TRACKER DATA EXCHANGE) is provided to send to and receive data from TRACKER PRO. TRACKER DATA EXCHANGE (TDE) can read to and write from a database like SQL SERVER/MYSQL.This helps to seamlessly connect the machine to an ERP or Accounting System. TDE also has inbuilt features to generate many reports and can be used as an independent application in the absence ofother ERP or accounting systems. Tracker ultra-billing machines are designed for retail cash billing at sales outlets which requires extra power. It works efficiently for stand-alone and also networked retail outlets. 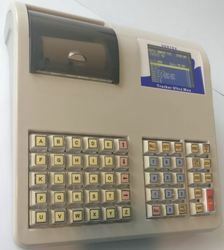 The tracker ultra-billing machines can be connected to the server through GPRS or Wi-Fi connections. It has the facility to print in multiple languages; it has SMS facility which intimates on transaction and connection details. The Tracker ultra-billing system has 16x1 inbuilt customer display and inbuilt battery which can sustain for 8 working hours and 1000 bill printing. The tracker ultra-billing system has the provision to tag waiter’s name. The tab also facilitates to search any item either through a code name or through an image. It is designed to print in any languages and is calibrated to calculate tax as per the requirement and items used. It also has the facility to record incoming and outgoing cash details. Report generation has been very easy with the tracker ultra-billing machines; it has the facility to generate reports depending upon the requirement such as day report, canceled bill report, department wise report, table report, waiter report, waiter commission report, account statement for customer accounts with transaction and payments, unpaid KOT report etc. The tracker ultra-billing machines have helped to prevent any kind of fraud transaction such as duplicate bill count. It has a huge memory space that can suffice 50,000 bills and store maximum information on transaction and stock reports. It has SMS options which provide hourly sale report, canceled bill report, and report generation time generates sales report on missed call. It is also designed to send bill info to customer numbers. The GPRS facility in tracker ultra-billing machines can send bills and stock details from machines to the server and can retrieve the rate structure and stock setting from the server to machines. There is also free server software to receive data and store in SQL/MYSQL/EXCEL database. Tracker Ultra supports 4 additional Wi-Fi printers for printing KOT. The KOT will be printed on the respective printers based on the setting made for each item in the machine. Developed by skilled professionals, the offered Professional Hand Held Terminal is one of the finest that are available in the market. Its development involves the utilization of the finest technology. Owing to this, the product has an error free coding, superior performance and is impeccably user friendly. In addition, it is marked at the most reasonable rate possible. Looking for Spot Billing Machine ?